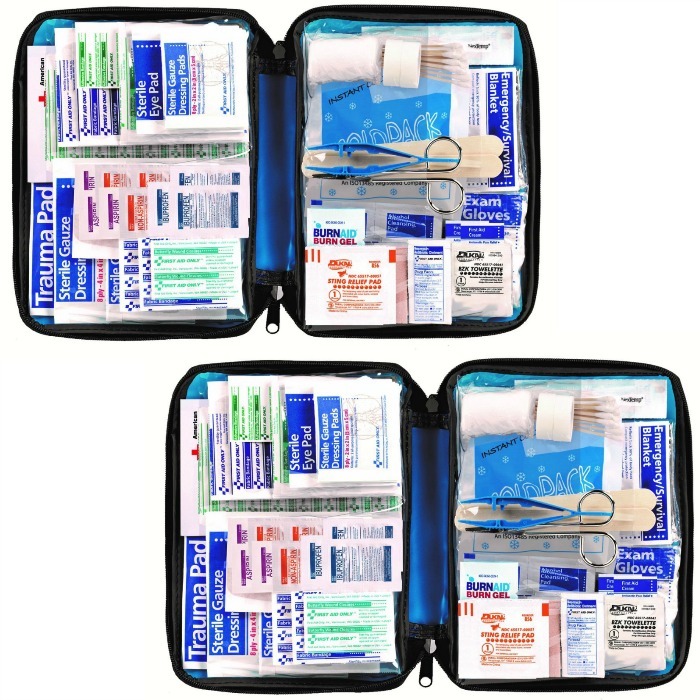 299-Piece First Aid Kit Just $11.85! Down From $27! You are here: Home / Great Deals / Amazon Deals / 299-Piece First Aid Kit Just $11.85! Down From $27! Amazon has this 299-Piece First Aid Kit for just $11.85 (Reg. $27)! Plus you can get FREE shipping on orders over $49 or if you are an Amazon Prime Member. Be ready for all potential emergencies at home, in the car, outdoors or on the water. First Aid Only, offers this 299 pieces all-purpose soft-sided first aid kit, developed to save time and frustration in the midst of emergency situations. Supplies are easy to find in our patent pending, clear-pocket pages. Kit includes: first aid guide, vinyl gloves, bandages, cold compress, gauze pads, trauma pad, cotton-tipped applicators, first aid tape roll, antiseptics and all three common OTC pain medications.